Stokknes beach and the Vestrahorn are reached by taking a side road just northeast of the town of Hofn from the ring road. Pay an entrance fee at the Viking cafe and then explore this photogenic area. Single exposure with a Canon 5DSR and Canon 24-105 f/4L lens at f/13 and a 1s exposure at ISO 100. 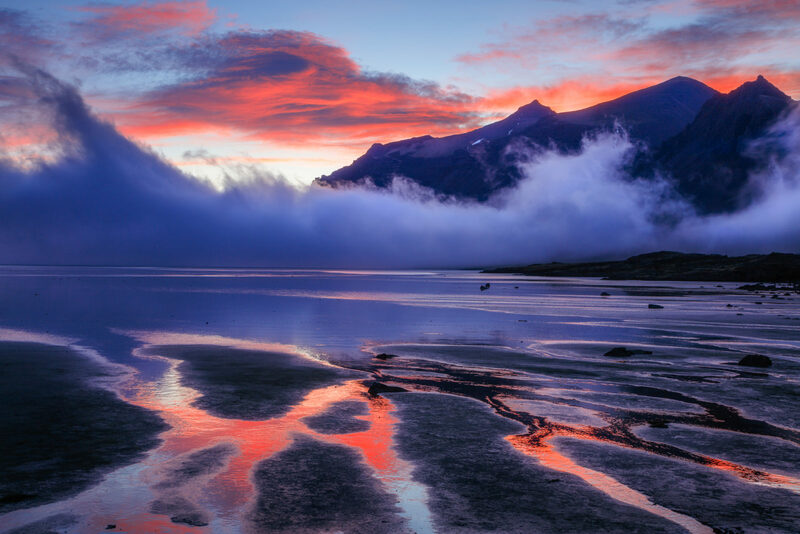 This was a May sunset from Stokknes Beach looking North along the Skarðsfjörður lagoon. It was a windy evening and clouds were pouring over the nearby Vestrahorn mountain - which is the icon that usually draws the attention of photographers. We had a spectacular sunset to the northwest and I started looking for some leading lines on the beach. This spot seemed perfect, with reflected color leading to the low-hanging clouds and up to the colorful sky.